People always ask, "how do you do it?" or "what goes on in a video lesson?" For teachers and parents the other thing I was looking for in the video was the addend you get when you figure out the problem... x + 9 = 15 is the same as 15 - 9 = x AND the same as 1 + 5 = 6...one being the addend for the nine. Pretty easy, and fun. The magic (if there is any) is in the blocks and the way they speak to the subconscious mind...also we know there is power in including more senses in the learning process. 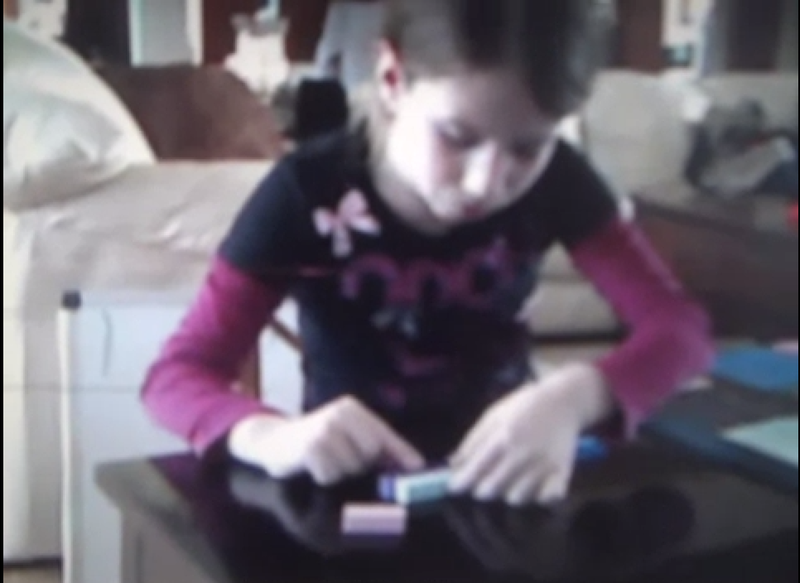 Getting her hands on the blocks makes a difference...more sensory input = more learning, easier and faster. If you are interested in video tutoring there's more information here but basically I charge the ridiculously low rate of $40.00...you need a set of blocks on your end and google vid chat or skype and off we go. A little Q&A with Crewton Ramone. I have been browsing your website for a while and I love your approach to teaching maths. I have two young children, the youngest is two and a half, and the other one almost five. I found a small set of manipulatives second-hand, and together we've been playing around a bit with them. I have sometimes difficulty finding a good balance between introducing new insights and making sure it all sinks in and they're fluent with it (I am so afraid I will bore them that I tend to charge ahead). So, with the eldest just having started school, I was looking for some tools to bring a bit more structure to our sessions, and to have some materials to make it feel a bit more like 'real' school (he's so keen it's almost funny). So, I was thinking of ordering a curriculum starter kit, but I had a few more questions. Firstly, have you any idea how long international shipment would take? We're based in Ireland, so virtually the opposite side of the globe. If that boat is taking 6 weeks to reach the west coast, god knows how long before it reaches these shores. We do have friends living in the states (Texas) who are planning to visit us over Thanksgiving. Would priority shipment to their address still be feasible? Another question I have is what the range of material is that is included in the curriculum starter kit. What kind of ground does it cover compared to school. Is it first grade, or first and second grade? Or does it go further? Mind you, part of the appeal of your approach, I feel, is that it is so different from the way things are being approached in primary school. The more I can keep the disconnect, the better! Very hard to compare the traditional method of grade levels with Mortensen because we teach them math concepts from day one which include algebra and problem solving...once you understand math and can decode the symbols you can see how the basic concepts apply to what they call higher mathematics...I have students bring their text books all the time and then show them with blocks what the symbols mean and WHY they learn the rules and process that they do. With some creativity and imagination there is very little the blocks can't show...counting through calculus. The Geometry in found in the measurement books. And the books cover many math concepts but certainly not all of them. However it has been my experience that with the firm foundation it gives the math becomes easy and understandable, especially when approached with a "can do" attitude. Students can jump in and out of the mainstream approach with ease...because they can see what they are doing and what the symbols mean. Take a look around my website and blog and if more questions arise: ask. When you get to the password pages even more will open for you and yours. I am in college algebra at Germanna Community College, recently, I stumbled across your site and was really surprised to see how enjoyable you make learning math. I have struggled with math for so many years, and I have only recently begun to enjoy math and slowly, but surely I am beginning to see how simple even the most complex math problems can be. I believe that having a concrete foundation of mathematical concepts opens up a world of opportunities for an individual, and individuals like you really make a difference in the lives of students.Thank you for sharing your knowledge and gift for teaching, I have told many other students in my class about your website and I know you are making math so much easier for my college algebra class.I would love to utilize your website even more, and If possible, I was hoping I could receive a password for tweets and/or FB postings? There are lots of vids and blog posts...too. I am tutoring an adult student GED math with strategies and methods from Crewton Ramone’s House of Math. She doesn’t know most of her multiplication tables and has a difficult time retaining information. With help from theh CR website, I am able to teach her area, squares and square roots, percents, ratio and proportion, and solving 2 step algebra equations WHILE she learns her times tables. Just to clarify, how long does it take to get materials from you? Depends on what you order and how you want it shipped. Also if it's drop shipped by mortensen co it can take a week or two...but often if you order Monday you'll have it by Friday or the following Monday. I have two daughters ages 8 and 9 that I homeschool and I am in need of a good math program. Question: Does Mortensen Math work well even if I do not consider myself a math type? I am one of those countless females who were told at a young age that "girls aren't any good at math" and believed it. But I do not want my girls buying into the same lie. And I am really having a difficult time deciding which direction and curriculum to go with this. Last year someone recommended Rod and Staff to me and that was a big mistake. My oldest never did learn how to subtract very well from it. And my other daughter has only been here with us from China for 10 months now and recovering from orphanage trauma, also having never gone to school before a day in her life until now. Just spend more time on my website and blog. More from the make math fun file. Two brothers playing and learning together. 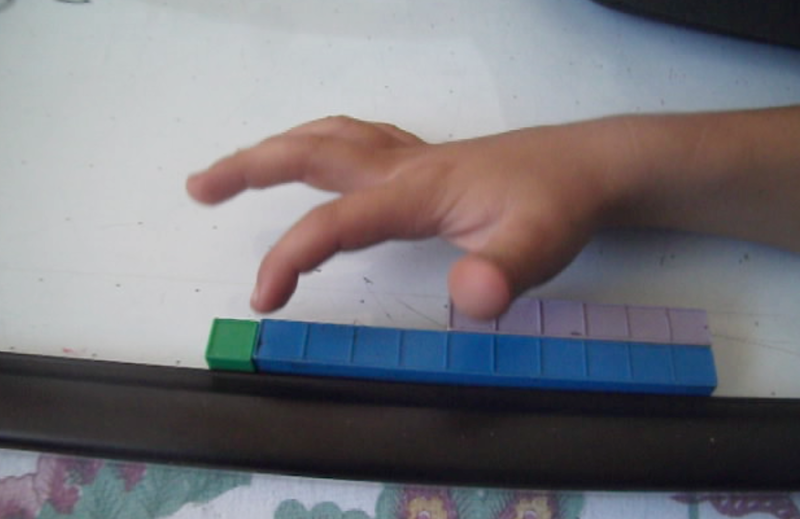 Here is a clip from a session with a couple of little boys who are just getting the hang of addends. One is 5 and has had very little exposure to math concepts or numbers and the other is older but has a few 'challenges' but is eager to learn. The basic concept here is numbers are made out of other numbers and we also get some addends practice by solving for x (which is of course "the trick") where they figure out what's under the cloth...listen to the excitement and the laughter. IT'S FUN. Math can be fun if you let it. Also note that like a lot of kids the one child is still not sure of the symbols and what they mean so we do a quick digression into what the symbols mean but then return to the fun part where we are basically playing what's under the cup but have a cloth instead. It's not magic it's math. The younger boy still has to count because he doesn't know his addends. The older boy has more experience and it builds his confidence as he gets answers right. They both laugh and have fun and although there is always competition and sibling rivalry we use it to best effect as motivation, and we keep it lively, light and fun. This is a fun way teach addition using addends. As the younger boy gets some practice he won't have to count one by one he'll be able to use the addend to make it faster. At the end the older boy has made a problem for me...that's fun too. It also tells you if they understand the problems well enough to create one. It helps them attain mastery to make up their own problems and is an extremely effective teaching tool. The children are placed in a math rich environment where they can not fail, and then encouraged to do some self directed learning. Note how we can see the associative property of addition but we never even mention it, but when we do it will be easy to understand because they have SEEN it already. Obviously I don't have permission to show their faces, you are forewarned, starting Jan 1, 2013 those who don't give permission to use their kids in vids and on the websites are going to get 86'd as 2013 will be all work on the web all the time. My one on one tutoring days are drawing to a close. Will be focusing on groups and if it is solo then the sessions will be used to train others too via youtube vids and web pages and maybe even video products.